“Get used to it,” Donald Trump’s counselor Kellyanne Conway tweeted in the middle of the chaos created by a selective immigration ban signed by President Donald Trump late last week. “POTUS is a man of action,” she continued, “Promises made, promises kept...a shock to the system.” Conway’s words were unseemly and callous, but they typify the now-familiar aesthetics of the Trump administration: the celebration of victory over an invisible enemy (“the system”) expressed in aggressive terms, and the celebration of a heroic singular man with the rare ability to be active in a land of inaction. It’s an aesthetic that values size and movement as means in and of themselves, revels in emotional expression over collective rights, and turns the political terror of others into pleasure. In 1936, Walter Benjamin famously argued in The Work of Art in the Age of Mechanical Reproduction that “the logical result of Fascism is the introduction of aesthetics into political life.” According to Benjamin, technology killed what he called the aura, that unique and irresistible value that art had prior to the invention of the photograph; its originality and the cultural values contained within the production of an original (genius, religion, nationalism, etc). Once the aura had been degraded and the concept of the original turned meaningless, Benjamin argued that fascism would exploit the mass longing for the original by introducing that aesthetic into political life. Fascism would pretend to fulfill that longing for those lost values to, in the familiar language of Trump, make America great again. Instead, it would simply offer a deformed copy of those civic values retooled to serve the belligerent imperative of xenophobic nationalism. 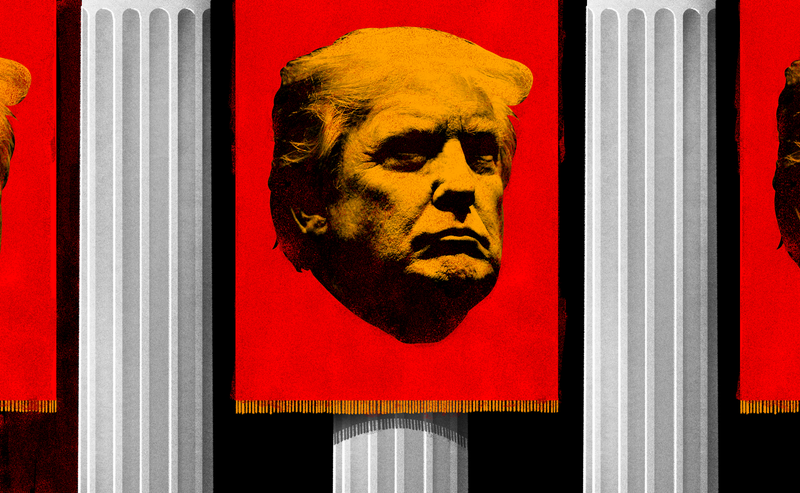 “Fascism,” Benjamin wrote, “sees its salvation in giving the masses not their right, but instead a chance to express themselves.” The fascist aesthetic reduces politics to spectacle, to a series of false imperatives that masquerade as truth. It does justice to emotional demands but disregards reason, it is invested in sentiment but not critique, and aesthetics triumph over ethics. The fascist aesthetic is a civic ritual with a clear litany, one clearly described by Benjamin and now being enacted by the Trump administration. Size, shock, action, boldness and a readiness to wage battle are visual concepts regularly employed by Trump, as well as members of his administration. The near-constant use of these kinds of words creates a particular image, as though something tangible is actually being described. As Conway celebrated “shock”—a word that conjures up militarism—and the media unironically repeated the equally combative phrase “extreme vetting,” the President mocked Senator Chuck Schumer for crying “fake tears” and criticized Senators Lindsay Graham and John McCain as “weak.” As both Conway and Trump were both working to construct the image of him as a potent leader, they simultaneously engaged in the rhetoric of size and time. Only a few hundred people were detained in the ban, and there were only a “few problems,” Trump argued; family separation was “temporary” Conway told Fox News. I know when I do good speeches. I know when I do bad speeches. That speech was a total home run. They loved it… People loved it. They loved it. They gave me a standing ovation for a long period of time. They never even sat down, most of them, during the speech. There was love in the room. You and other networks covered it very inaccurately… That speech was a good speech. And you and a couple of other networks tried to downplay that speech. And it was very, very unfortunate that you did. It’s a lie that the Trump administration has repeated on multiple occasions in the few days that he’s been the president. “Alternative facts,” Conway dubbed that particular lie, an off-the-cuff phrasing that could be the cri de coeur of the Tea Party politics that sprouted Trump’s rise. An inauguration is ready made for the camera, already designed to be spectacular for a television screen, so perhaps it’s unsurprising that it would become such a point of contention for the Trump administration. The lies are important—the size of the crowd, their adherence to a certain ideology, and their emotional dispositions are all equally part of what Susan Sontag identified as a fascism’s “transformation of reality” of “history become theater,” or of unfettered aestheticization politics. Sontag was writing about Leni Riefenstahl, the infamous filmmaker who produced sleek Nazi propaganda like Triumph of the Will, a pseudo-documentary of 1934 Nazi Party Congress in Nuremberg. The rally was made for her camera, people arranged like props, and “the event, instead of being an end in itself, served as the set of a film which was then to assume the character of an authentic documentary,” Sontag writes. Anyone who defends Riefenstahl’s films as documentaries, if documentary is to be distinguished from propaganda, is being ingenuous. In Triumph of the Will, the document (the image) is no longer simply the record of reality; “reality” has been constructed to serve the image. In Sontag’s compelling argument, like Benjamin, the fascist aesthetic undermines reality. There is no authentic original, there is only longing for the reconstitution of the perception of the original and its fascist exploitation. If there is only the image or only spectacle, then hard numbers serve no purpose; it simply doesn’t matter if roughly 300,000 people attended Trump’s inauguration versus the 1.8 million who attended President Obama’s 2009 inauguration. It simply matters that there was a big crowd and that they were uniformly enthusiastic in their reception of President Trump. It simply matters that they were there to make America great again, not whether or not their concept of the cohesion of the state or history or nationalism is actually real. Riefenstahl’s remix of reality—her filmic conflation of the factual and the fictional—were deeply influential, not only to a modern iteration of filmmaking but to White House senior counselor Stephen Bannon. In a comparison almost too ridiculous to be true, Andrew Breitbart once compared Bannon, a former documentary filmmaker (documentary, again, in the loosest sense), to Riefenstahl. “People have said I’m like Leni Riefenstahl,” Bannon told the Wall Street Journal in 2011 while promoting his Sarah Palin documentary, The Undefeated. “I’m a student of Michael Moore’s films, of [Sergei] Eisenstein, Riefenstahl. Leave the politics aside, you have to learn from those past masters on how they were trying to communicate their ideas,” Bannon added. Here Bannon appeals to the artsiness of Riefenstahl’s films (similarly those of Soviet filmmaker Eisenstein) as though the ideology that underpins them can be disjoined from the aesthetic. Sontag argues that it simply cannot—that Riefenstahl’s favoring of the image over the actual events is the natural result of fascism’s demands. What’s clear though is that Bannon is intimately familiar with such a spectacle and its constant repetition in the White House is likely not accidental. Rather the degradation of objective reality is central to the fascist aesthetic. It’s not that facts are not real or do not exist, it’s simply that they’re unstable and in need of constant interpretation—like a Riefenstahl film, alternative facts are a fiction that poses as truth. Who better to interpret them than Trump? A man, that Conway has said, is singular in both vision and action. With politics reduced to aesthetic expression, the ownership of truth belongs to a willful individual. The emotions and the disposition of the crowd are as important as its size. Not only do the People need to be enthralled by a singular leader but they need to agree. If there is dissent, then it is immediately suspect, as is disagreement. Because the fascist aesthetic is built on a house of cards, it cannot withstand criticism. “For Ur-Fascism,” Eco writes, “disagreement is treason.” Disagreement points directly to the “theatrical fiction” that the happy crowd acts in complete submissive agreement with its leader. This is why any minor criticism of Trump is met with forcible pushback. Sean Spicer holds up offensive tweet. While defending the White House’s xenophobic ban on Muslim immigrants and visa holders, press secretary Sean Spicer told the media that the “career bureaucrats” that disagreed with the President should “either get with the program or they can go.” That demand for complete capitulation to Trump’s will was reiterated when the White House fired Sally Yates, the acting Attorney General fired last week. Yates was framed as a traitor; she had, according to the White House statement, “betrayed” the administration by refusing to enforce Trump’s executive order on immigration. Like Senators Graham and McCain, Yates was described as “weak,” short-sighted and unable to see the lurking threat at America’s borders. “It’s time to get serious about protecting our country,” the statement said. “Calling for tougher vetting for individuals traveling from seven dangerous places is not extreme. It is reasonable and necessary to protect our country.” The justification is the truth. Ur-Fascism says that their only privilege is the most common one, to be born in the same country. This is the origin of nationalism. Besides, the only ones who can provide an identity to the nation are its enemies. Thus at the root of the Ur-Fascist psychology there is the obsession with a plot, possibly an international one. The followers must feel besieged. The easiest way to solve the plot is the appeal to xenophobia. A simple statement on the firing of Yates manages to cover nationalism’s bases in a handful of sentences. Extreme vetting, the statement implied, is not extreme, simply a necessity in the new bellicose and dangerous world where the enemy is easily identifiable by their religion or skin color, by their very otherness. The Trump administration positions itself as heroic, willing to do what is necessary, including the construction of monumental architecture, even though political correctness (another nefarious force) threatens to undermine at every turn. Trump’s action is part of his masculinity, his heroism. Action and movement—this is the stuff of the fascist aesthetic. To move against an enemy, even if that enemy exists only as a metaphor for nationalist discourse, is to show action. Passivity is “trafficking with the enemy,” Eco writes. Hence, Barack Obama’s refusal to rain down bombs on just anyone was a sign of collaboration with the lurking Muslim enemy—this was another sign of Obama’s otherness, more proof of his falsified birth certificate. Throughout the campaign, Sessions has been the fiercest, most dedicated, and most loyal promoter in Congress of Trump’s agenda, and has played a critical role as the clearinghouse for policy and philosophy to undergird the implementation of that agenda. What we are witnessing now is the birth of a new political order, and the more frantic a handful of media elites become, the more powerful that new political order becomes itself. “A new political order” is a terrifying turn of phrase, particularly since Bannon’s sense of order is steeped the order of the alt-right. Even conservatives find it difficult to defend Bannon’s ideologies, recently the National Review offered up the half-hearted defense that Bannon’s point of view may be “ugly,” but at least he’s “not Josef Goebbels,” referring to the Nazi Minister of Propaganda. What’s perhaps most telling about Bannon’s rare public statement is its summary of the fascist aesthetic in a few quick sentences: the emphasis on strength and loyalty, on heroism, the reaffirmation of the will of the People, the confirmation that ostensibly failing institutions will not be rebuilt but instead razed. Bannon’s statement implies that those are not willing members of the new world order are not the People, they are not good citizens who value respect and honor and loyalty. Rather, they are suspect, the elite who desperately grasp to power through lies and misrepresentation in order to preserve their power. They, whoever they are, are part of the plot working against the People, one that only the visionaries granted authority are able to truly see. The media spins fake news, the media is filled with rich liars, the media purposefully misrepresents Trump and thus the will of the People. This is fundamentally why the media’s facts cannot withstand the Trump administration’s alternative facts. Reality can not withstand the image—the elite cannot prove that they are not elite, that they don’t live a bubble, the image simply exists without a flesh and blood signifier. Despite this, the fascist aesthetic understands that the media will not abandon it—spectacle cannot resist spectacle. Instead, it exploits the media for its own gain, it threatens and is openly hostile, yet thrives on coverage of the fight; it revels in repetition and forgiveness. On one day, Spicer can spin “alternative facts” and the media will quickly forgive him. “Spicer exhibited humor, patience and a markedly more positive disposition in his first interaction with reporters in his new role Monday,” US News wrote a day after Spicer berated the press in his first news conference. A few days later, Spicer claimed that a five-year-old could be a terrorist. It’s a poignant reminder that Walter Benjamin described the conditions of the fascist aesthetic a few years after he fled his native Germany. Benjamin intended to come to the United States but as Europe collapsed, he was unable to flee the continent. Four years after he wrote The Work of Art, Benjamin realized that he was trapped, his fate sealed. Rather than being deported to France where he would surely be sent to a concentration camp, Benjamin committed suicide on September 25, 1940. Benjamin didn’t write with the critic’s distance but rather while actually bearing the weight of the fascist aesthetic; the theatrical blurring of boundaries between reality and fiction, its rendering of terror for the sake of pleasure was, for him, deadly. Death, Benjamin argued, was exactly what the fascist aesthetic seeks, it is its very purpose. That point was reiterated by both by Sontag and Eco who all agreed that the natural outcome of fascism was the manifestation of its death fetish. “The seduction is beauty, the justification is honesty, the aim is ecstasy, the fantasy is death,” Sontag wrote. Death and war are perhaps chilling conclusions, but they are ones nonetheless.